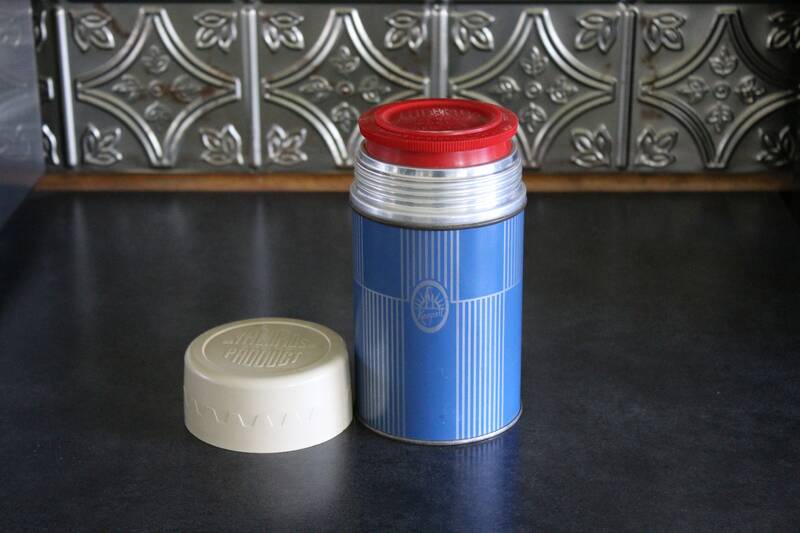 This vintage blue Thermos is a pint size Keapsit with the penguin logo. It has an aluminum neck, Stronglas interior, the Polly Red Top and a beige cup. It was made sometime around the mid-century. It would look great in a retro camper, cabin décor, or boy's room. This metal Thermos is in excellent vintage condition with minor signs of age. I hear what sounds like a couple of grains of sand when I turn it upside down. I notice a slight stale odor. I washed it out with vinegar and am letting it get air. It holds water and keeps drinks hot or cold. Please use your zoom for a good look.